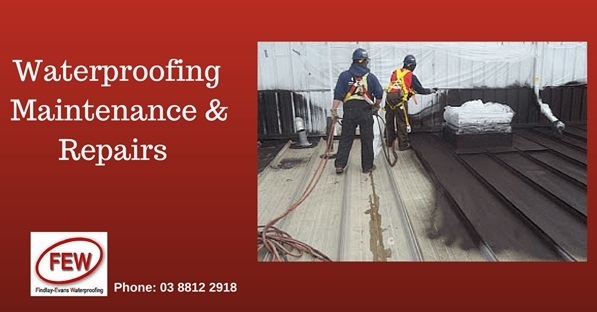 Findlay & Evans is a specialist waterproofing company based in Melbourne providing waterproofing, concrete repair and remedial protective coatings. Reputation for challenging & difficult remedial & restoration waterproofing projects. Deliver full service and knowledge-led structural waterproofing solutions. Reputation built on for supplying an honest & professional service. Fully covered by comprehensive and specialist insurances and guarantees. Why Use Findlay & Evans Waterproofing? We have been in the construction industry & waterproofing sector for over 30 years. As Registered Building Practitioners we combine structural & construction knowledge & experience together with water prevention and containment. A Recently Installed Waterproofing Membrane is Leaking -What Next? Problems With Water Leaks ……?? Findlay & Evans has the construction experience & knowledge to fix​ just about any challenging water ingress. A waterproofing company with building experience – a critical point of difference when solving structural damage and remedial works. A waterproofing company that can solve & micro-manage all your remedial & property water damage problems. A waterproofing company with guarantees & warranties – we stand behind all our work because our technicians are fully trained – no subcontract labour. So whether the project is a tunnel, water treatment plant, planter boxes,balcony, green roof, underground facility, parking deck, new roof or refurbishing an existing roof we can offer solutions.